These Fiberglass Water Tanks are long-lasting storage units that can store multiple liquids ranging from potable water to high grade chemicals. Much like a poly tank, the fiberglass material makes these storage units highly resistant to rusting and corroding. This can be especially useful if you are looking to store your aboveground tank outdoors, as its exterior is built to handle the elements. With little to no site prep required, this above ground tank offers the storage you need with no hassle to you. 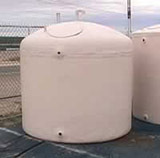 These fiberglass water tanks are manufactured with a dome-top design. However, if you need a tank that has a different size or specification please ask! Fiberglass is an extremely flexible material that can be shaped to many sizes.